After several leaks, Aston’s new twelve-cylinder roadster has finally been revealed. It&apos;s taken three years for Aston Martin to chop the top off its twelve-cylinder baby, but the Roadster version of the V12 Vantage is finally here, and it&apos;s a welcome addition to the lineup. Power comes from the same 6.0-liter V12 that powers the existing coupe (along with just about everything else Aston makes), driving 510 horsepower and 420 lb-ft of torque through a six-speed manual to the rear wheels. Only this time it&apos;s in a two-seat cabriolet. With well-delivered gear changes, sprinting to 62 mph should take no more than 4.5 seconds, and with the pedal to the metal the speedo will eventually hit 190 mph. Specifications are largely the same as the coupe on which it&apos;s based, save for a redesigned rear boot lid, lower front air intake, a modified rear damper setup, front and rear damper valve tuning and a new rear spring design. Compared to the V8 Vantage Roadster, the V12 model gets carbon-fiber everywhere, from the handmade front splitter and rear diffuser to the mirror caps and rear lamp surrounds. An interior package adding a carbon-fiber fascia and gearshift surround is also available. The hard-top&apos;s Sport button is also carried over, sharpening response and opening up the exhaust valves for increased engine noise. Aston Martin Chief Executive Officer Dr Ulrich Bez said: "The V12 Vantage models are, first and foremost, driver&apos;s cars - inviting and fully rewarding the driver&apos;s full involvement. 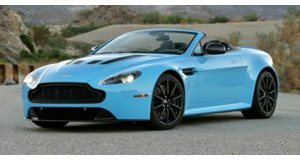 I believe no other car in this class offers the combination of the V12 Vantage Roadster&apos;s prestige, six-speed manual gearbox and the unique enjoyment that driving a high performance convertible can deliver." Available to order in selected markets now, the new Aston Martin V12 Vantage Roadster is priced at £150,000 in the UK, representing a £15k premium over the coupe. The British carmaker claim its newest convertible is a limited edition model, but if the drop-top equals the demand of the coupe then expect it to become a permanent fixture on the Vantage catalogue.